Lately, I haven’t written much here. Not because words have eluded me but because life has been a deluge. I have been umbrella-less, soaked, face upturned, eyes closed and experiencing a light drizzle matting down my hair. Other moments, being subjected to stinging, pelting torrents. In between the tumultuous extremes, I have felt warmth breaking through the lumpy, gray clouds. The sensation of sunlight on my eyelids that have caused them to fly open. When I have looked up through dampened lashes, I have glimpsed rainbows. Day after day after day. Not one or two or three, more like five or six. Extravagant jewels in the skies. At times, only a fragment of multi-colored hues, but rainbows just the same. I have savored them, letting my gaze remain fixed on their transparent beauty. My emotions have soared amidst the slowly moving skyscape, flitting here and there, bathed in flecks of violet and indigo. A sense of hope has permeated my spirit. There is no shaking it off, no angry skies that can blanket it, no lightening zig zags that can electrocute it. Anticipation remains, expectant, receptive to whatever it is that is now concealed by a watery, dribbling mist. i read the golden soot on my eyelashes poem right before this and they seem like two pieces to the same puzzle. i love to see artists’ collaborations like this — thank you for sharing so authentically! Haha, it’s all good Charles. Thanks! I believe all the rainbows we’ve seen in the last few days are a sign–a very good, hopeful sign. After all the storms there is peace and hope!!! Pamela, that was a beautiful testament to the human spirit as well as to nature, juxtaposed perfectly! Thanks, it’s true. . .without the rain, no rainbows! 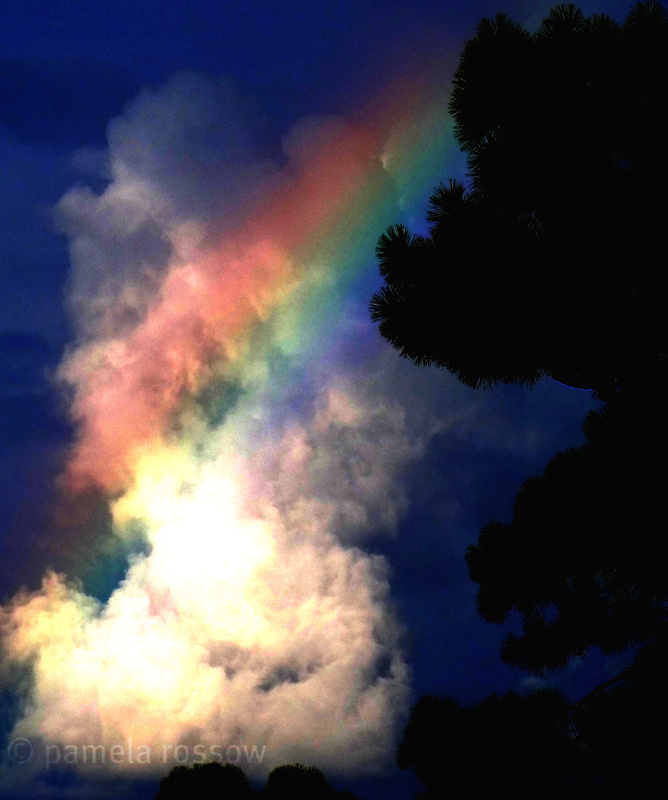 This is poetry…I love the description of rainbows being extravagant jewels in the sky. I hope so much that your sense of expectant hope remains and that you find your joy after all these days of rapidly changing emotion and experience. Awh, thanks hon. They do! I’m grateful and lucky to have seen so many of them days in a row after the rain!